The procedure for making dosa starts out almost identical to that for making idli. The idli recipe in this cookbook has some very good tips and variations that apply equally to dosai. Fold in half and remove with a metal spatula. Soak rice, dal, and fenugreek seeds together overnight. Grind these ingredients together to a very smooth consistency. Add the salt and enough water to make into a dropping consistency, and leave to rise for 5-6 hours, or overnight. Check consistency of the batter, and if needed, add enough water to make into a smooth pouring consistency. Heat tava (dosa pan) very hot, splash a little water over it, and with a ladle, immediately pour some batter onto it, spreading it thin, with a circular motion, without pressing too hard. (You will need some practice to get it right). Lower the heat and dribble a little oil around the edges. When edges start browning a bit, it is almost done. Add desired filling and fold over. On the day before, grind all the ingredients in a blender or specialized dosa grinder with water. The final consistency of the batter must be similar to pancake batter. Leave it overnight in a warm spot and allow it to ferment. This is a very important process and must not be skipped. During fermentation the batter may rise to almost twice its volume and therefore the container for the batter must allow for this. In a wok or other deep vessel heat the oil. When the oil is hot add the mustard seeds and allow it to splutter. When spluttering starts to recede add the chopped green chilies, curry leaves and the channa dal. Stir until the channa dal turns brown. (Be careful as channa dal can go from browned to burnt within seconds). Add the onions and fry until browned and add turmeric and stir for 2 minutes. Add ginger and garlic and stir it in for a few seconds. Add the boiled and coarsely mashed potatoes into the mix and fold well. Turn off the heat and add lemon juice and the coriander leaves. Fold well. Dosai can easily be made on a tava, iron frying pan or non-stick pan. Heat the pan on a medium heat until a drop of water evaporates on contact. 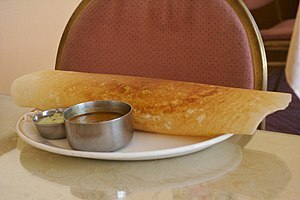 Spread about 1/2 cup of batter on the pan (like pancakes) slowing spreading it outwards forming a thin, flat circular dosa. Allow it cook for a minute and using a flat, sharp spatula flip it over. As the other side cooks spread a layer of ghee-shortening mixture on the topside. Flip it over again. As the bottom crisps add a Tsp of the onion chutney on the top and spread it evenly. Add some of the filling onto one half of the dosa and fold the other side over. Serve with coconut chutney. This page was last edited on 13 March 2019, at 15:56.